...Except, they're not, really. While the WileyFox Spark is a very cheap phone, coming in at only £90, we feel it comes across as a phone you'd only buy if the Samsung Galaxy S7 you're already using broke and you want something to use while you save for a new one. It's worth noting that we're reviewing the base model Spark, and not the Spark+ or Spark X.
WileyFox always delivers on design. The Spark is a thin and lightweight phone that feels good in your hands. The textured back means this thing won't be slipping away from you any time soon either. The headphone jack follows the HTC trend of coming in at the top of the device, which I personally find to be more tedious when using wired headphones. The camera only slightly protrudes from the rear casing, but it still means if you're using the phone without a cover it's the first thing to touch the surface. The speakers are placed on the back of the device which means most of time, when you're holding the phone, you'll be blocking the audio (which isn't really loud to begin with). The Spark features a five-inch HD display. That's pretty good for such a cheap phone, but don't go thinking it'll blow your mind. It packs 294 pixels per inch. The colours pop whether you're gaming or just reading on the go, it gets the job done. WileyFox always manages to add their own personal touches to its phones, and that helps differentiate them from everything else out there. The orange writing on the back and earpiece on the front give the phone a bit of flare and attitude that I really like. The phone doesn't look budget — but using the phone on a daily basis does reveal some of the cheap nuances of the device. When I first got it I had to fit the battery, but WileyFox hasn't made that easy, I ended up making a deep mark on the phone trying to pry open the back and get the battery in. Aspects of the phone like this make it seem archaic, but once you do get the back off, you're able to fit two sims and a MicroSD card for expandable memory. Because the phone is made on a budget, it does mean there's no NFC, meaning you miss out on nifty features like Android Pay, which is already a deal breaker for some. 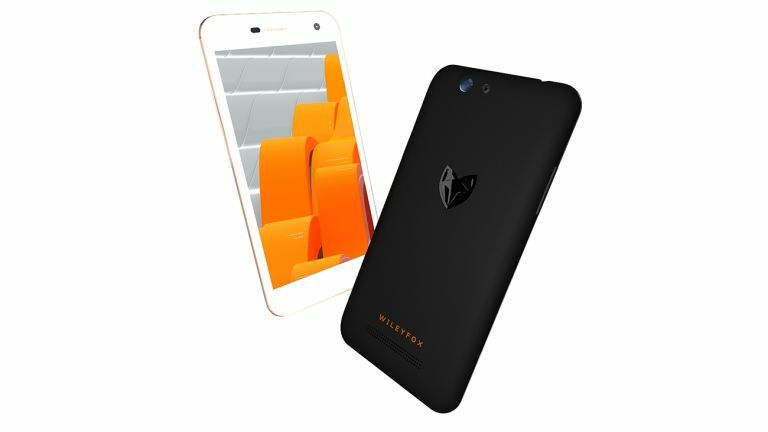 WileyFox is making a cheap phone — that means the Spark takes a hit in the specs department. The internals of the phone comprise of a 1.3GHz quad-core processor and 1GB of RAM. Yes, I already know what you're thinking, only 1GB of RAM? That one specification seems to be the cause of a litany of performance problems for the Spark. Things all start from the setup menus that chug, and they're only a sign of things to come. Once you've got started and installed a few apps — assuming you haven't taken up all of the 8GB of internal storage (only about 3GB can actually be used) you'll have an experience that can only be described as heinously slow. It seems unfathomable that navigating the menus of the Cyanogen based Android OS can cause the phone trouble. But even just going through the phone's settings can result in pressing a button, waiting, reconsidering if you pressed the button in the first place because it takes so long to load, tapping again and again until the application crashes. This story is one of regularity when using the WileyFox Spark. The battery life in the Spark won't get you through a day in real world usage, some slow web browsing, app crashing and music playback will have you needing a recharge at some point. I had this problem — so I thought why not plug it into my computer while I'm working for the lack of wall outlets. The phone told me it would be fully charged in 6 hours. The phone got its juice back more reasonably through a wall outlet but it's worth noting charging through a computer isn't a viable option when out and about. Once again the 1GB of RAM kills the Sparks performance. The phone features an 8MP camera on both the front and back of the device. The camera menu is fairly standard and seems designed around taking quick shots. Of course, your subject will have moved by the time the camera app actually decides to load up. There are big buttons for the shutter, video and panorama pictures — you'll also find further settings to adjust the flash, exposure and white balance. The back camera takes pictures that can look slightly washed out compared to similar sensors out there. If you're taking pictures in a dark environment then the camera isn't going to shine at all. But if you're taking pictures with good lighting, you're getting a pretty competent camera for the £90 asking price. The front sensor is probably one of the best features on the phone. The 8MP sensor here takes great selfies and while out and about testing the device, several of my friends opted to take selfies on the Spark over their own smartphones — you get some nice detail in the front snaps. Both cameras also record in 1080p and can get take some decent footage, but don't expect anything other than the essentials — there's no optical image stabilisation here. The WileyFox Spark proves the term 'you get what you pay for' really does hold substance. There are more competent and even cheaper smartphones out there like last years Motorola Moto E. However, it's worth forking over the extra cash and getting a smartphone that performs a whole lot better. The Spark+ and Spark X both offer double the RAM with the Spark+ being priced at £115. I can't recommend the Spark to anyone based on its performance. The phone is all caveats with very few redeeming features. It's constantly fighting a losing battle with its operating system and doesn't provide the user with an experience that's worth the £90 asking price.